Cooling towers have been used in industry since the early 19th century. It is basically a heat rejection device or heat exchanger in which water and air are brought into contact with the purpose of lowering the temperature of the water. It’s not surprising that cooling tower technology lends itself to many applications including refineries, power plants, natural gas processing plants, and commercial HVAC systems. Despite the fact that the basic cooling tower operating concept is easy to grasp, simply air interacting with water, like any other form of machinery proper maintenance is required for optimal performance. Even so, problems can develop and troubleshooting and repair will be required. Here are a few potential problems and possible solutions to consider. The water temperature rises unexpectedly. The recommended air flow may be low. Adjusting the blade level may correct this. The water flow may be above the recommended level. Take applicable steps to correct the rate of flow. The sprinkler output may be impeded resulting in poor distribution. Repair or replace the sprinkler or feed. Water flow not contacting the fills as designed. Check for water supply leaks or sprinkler issues. Flow of external air around tower is impeded. Check for air obstructions and that exhaust air is not being recycled. The fill is coated or checked requiring replacement or cleaning. There is excessive vibration or noise. Check the motor bearing and grease or replace it as required. The fan mount may have loosened. Retighten associated hardware. Various tower components may be rubbing against each other. Ensure that the proper tolerances are maintained. The fan may have become unbalanced. Take measures to rebalance it. The fan blocks may have loosened. Retighten them as needed. The motor shaft hub mounting might have loosened up. Tighten it back up. Note that this may require using shims. The cooling capacity has lowered unexpectedly. Check to see if the motor has stopped. If so, verify that the fuse is functional, the switch capacity is correct, and the switch contact is in good working order, clean, and adjusted as recommended. If the fan has stopped spinning check for a jammed bearing. Clear any obstructions and replace the bearing. If the motor RPM lowers unexpectedly first check that the starter is not defective. Next ensure that the electrical load is not too heavy. Finally, check that the supply voltage is within accepted range. If not, contact your power company. If the motor RPM cannot be raised to acceptable levels, check that the starter is serviceable and all the connections are clean, tight, and connected properly. If that all checks out, investigate whether the motor windings have been damaged. The water carries over the specified level. Check that the water flow through the filter is not being blocked. Unblock as needed. If the water sprinkler is rotating faster than specified adjust the speed and angle. Ensure that the sprinkler is not too high above the filter. If so, lower it to bring it within the specified range. The water conductivity is not within the acceptable range. Check to ensure that the probe for the controller is clean. If not, clean it with a clean cloth and avoid touching it with your fingers. Check the solenoid to ensure that debris is not stopping it from closing completely. This can cause excessive bleeding. Ensure that the float is located such that the water level remains within specifications. Be sure that there are no leaks in the cooling tower system. Verify that the chemical feed pump is properly primed. Adjust the chemical feed pump settings until the water conductivity is within the acceptable range. The motor temperature is too high. Check for a drop in voltage, that the fan is not out of balance, and that the stator is not touching the rotor. The water flow is reduced below specification. Ensure that no water distribution pipes are clogged or obstructed. Check that the strainer/filter is unobstructed. Check for any operational faults with the water pump. There is an unexpected water loss. Be sure the sprinkler RPM is within specified range. Check for compromised end caps. Make sure that FRP/PVC eliminators are located properly. 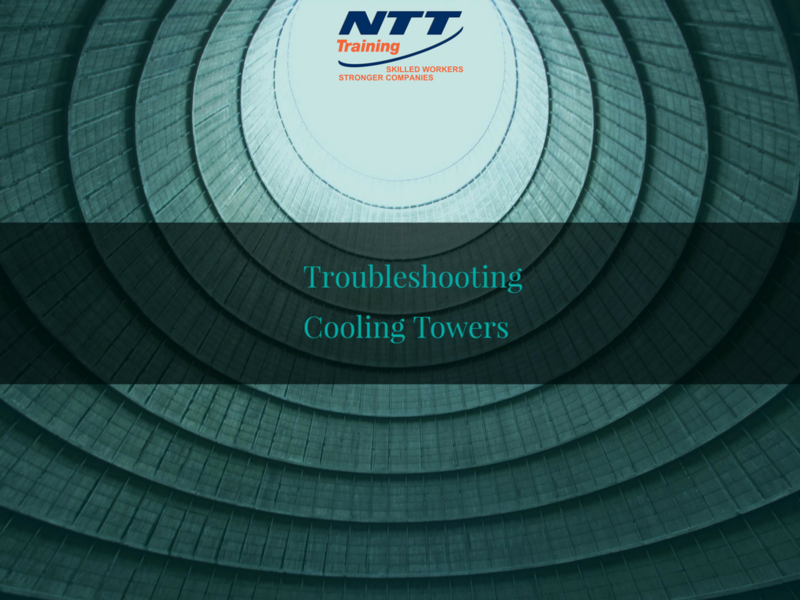 Whether your facility uses a crossflow, counter flow, induced draft, or other type of cooling tower, the troubleshooting ideas listed above should give you a practical jumping off point towards addressing basic troubleshooting issues. For more in-depth instruction, consider contacting NTT Inc. to attend one of our chilled water system operation and maintenance seminars. Our hands-on training will ensure that you and your maintenance staff are up to date on the latest techniques and solutions. You can rest assured that you will receive only the highest quality instruction since we are accredited by the ACCET (Accrediting Council for Continuing Education & Training).